We are back from Czech Tour 2018! During the past Easter week, the Calicantus Choir made a long tour in the Czech Republic. He took part in a large international competition in Prague where he collected all the first prizes in the categories “Academic Music”, “Historical Music”, “Contemporary Music” and “Folk music”! 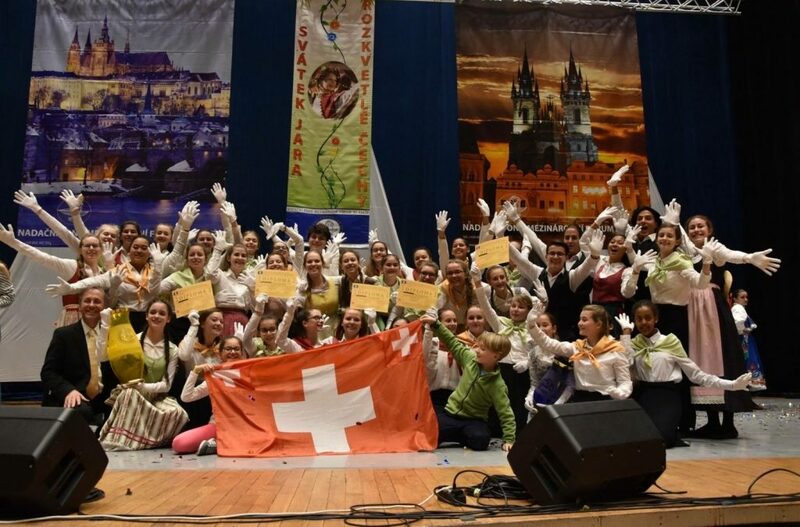 During the award ceremony at the Kongresovè Centrum the jury commented that he rarely granted the “Grand Prix” of this event, but in this edition he gave it to the Calicantus Children’s choir by virtue of an extraordinary exhibition of young people from Ticino led by their master Fontana. An excellent result, also according to many Swiss and foreign observers of the branch who have followed the exploits of our choir on facebook, in the face of groups of peers coming mainly from Eastern Europe. Later the young Swiss children also performed in Starometska square, as part of the official Easter celebrations of the City of Prague. They visited the prestigious Rudolfinum concert hall and performed various cultural activities. The Tour then took Calicantus to discover many places in the Moravian land, where he was received and welcomed by the Motýli choir in Sumperk. Our young people visit the small town of Loštice, where they discover a particular cheese whose curious story is explained in Italian. Then in the city of Šternberk they had a visit to the Museum of Time, a grandiose exhibition that starts from the Big Bang, explaining the evolution of matter, stars and galaxies. Following the Moravian plateau, a few meters from the Polish border, Tuesday, the two choirs performed a concert in common in Neratov, a small peasant village that hides a majestic pearl, a church forgotten since the post-war, now restored. Wednesday in the morning Calicantus offered a concert for three hundred students of the middle and upper schools of Sumperk; an intense moment, followed with great respect by their peers. The following day, a pictorial activity was prepared for the Swiss singers in the center “Villa Doris” leisure center for children and young people, where they offer and develop visual, textile, manual, musical, dance and theatrical arts. A paradise of creativity, managed and supported by the City of Sumperk and the Ministry of Culture, with a staff of professional teachers in various sectors. On Friday morning there was a reception with the Mayor and member of the Senate of the Republic, Mr. Zdenek Brož, who was given a letter from the Mayor of Locarno Alain Scherrer and some presents. The celebration of the 25th anniversary of Calicantus began in these days in Sumperk – where Maestro Fontana studied and collected inspiration at the beginning of the 90s – with the last gala concert in the majestic Santa Maria church, followed by a party with the two choirs, parents, teachers and authorities. THANK YOU MOTYLI SUMPERK!